Liu, M., Li, C., and Wang, Q. (2019). 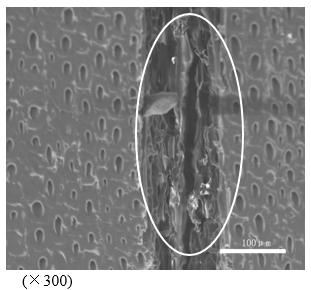 "Microstructural characteristics of larch wood treated by high-intensity microwave," BioRes. 14(1), 1174-1184. High-intensity microwave radiation was applied to treat and modify larch wood. 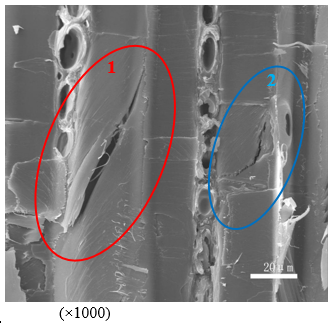 Using scanning electron microscopy, changes in the microstructure of larch wood due to microwave irradiation were analyzed. After the microwave treatment, the microstructure of the larch wood was varied in its weakest section. The changes of the microstructure, in the pits of the tracheid wall, the plane of the tracheid wall, and the wood ray tissue of the radial section, were notable. The cracks were located among the latewood tracheid, and some of them were throughout the wood ray section, so wood rays were broken along the vertical cell arrangement. The results showed that high-intensity microwave treatment effectively penetrates the narrow channels of larch wood. Larch wood is one of the main commercial softwoods, with a great volume of storage in northern China. Due to its low permeability and high resin content, larch wood is difficult to dry, to treat with fire retardants and preservatives, and to modify with chemicals. Research on the permeability of larch wood is of both theoretical and practical importance. The methods of improving wood permeability have been studied extensively at home and abroad. Simpson studied green samples of Quercus rubra, Orellia falcata, Liquidambar styraciflua, and Abies concolor, which were steamed at 373.2 K under saturated conditions. The results showed that pre-steamed samples generally dried faster than unsteamed controls (Simpson 1975). Liu (1994) improved the permeability of eucalyptus by heated treatment. After heat treatment, the pit membrane on the wall of the vessels was ruptured, or in some cases holes appeared due to dropping out of parts of the membrane (Liu 1994). Zhang et al. (2007) studied the permeability of wet heartwood of Comospore fir after steam blasting treatment, and the results showed that, with the increase of blasting temperature, pressure, and blasting frequency, the transverse permeability of wet heartwood increased (Zhang et al. 2007). Microwave treatment may greatly improve the permeability and impregnability of the heartwoods of the radiata pine, Douglas fir, and messmate (Torgovnikov and Vinden 2000; Vinden and Torgovnikov 2000; Torgovnikov and Vinden 2006). Zhang et al. (2013) studied the effects of microwave pre-treatments on moisture migration in larch wood. It is concluded that microwave pre-treatments can open some water pathways and accelerate moisture migration in larch wood (Zhang et al. 2013). MW modification ruptures some elements of wood structure and leads to timber strength reduction. 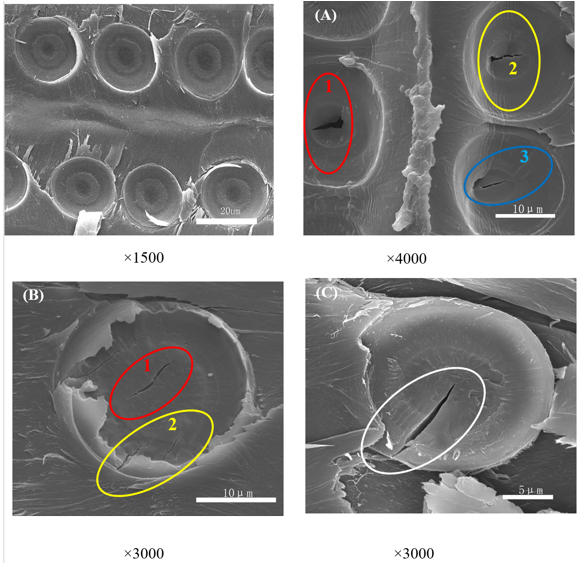 Microwave (MW) wood modification increases heartwood permeability and improves preservative distribution and uptake (Vinden et al. 2011). Moreover, the wood protection topic team of Northeast Forestry University (Harbin, China) applied high-intensity microwave radiation to larch wood to improve its permeability and also brought forward the wood “cell blasting” concept. In previous work, larch wood was treated with intensive microwaves, and its permeability was improved remarkably (Liu et al. 2005; Jiang et al. 2006; Zhou et al. 2007). 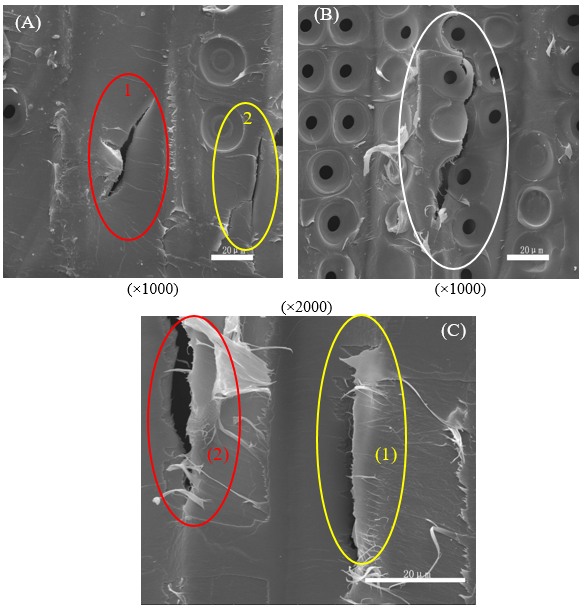 Based on these results, in this study, scanning electron microscopy was used to characterize the microstructure of larch wood treated by intensive microwave radiation. The test material larch (Larix dahurica Turcz.) lumber of size 60 mm × 300 mm × 4000 mm (longitude) was processed to yield wood samples with dimensions of 20 mm × 100 mm × 300 mm (longitude) and was covered within sealed bags. Based on earlier research findings (Jiang et al. 2006; Zhou et al. 2007), the microwave treatment conditions were a processing power of 23.8 kW and processing time of 50 s. Before microwave processing, the moisture content of the specimens was 30% to 40%. Larch plates were removed from the sealed bags. First, their moisture content and initial weights were measured. They were placed in the microwave treatment cavity, and the microwave treatment was initiated. A stopwatch was used to time the trial, and an infrared detector was used to measure wood surface temperature. The microwave equipment was the WLD24S-01, produced by Nanjing Sanle microwave technology development Co., LTD. The heating box has a multi-point microwave feed inlet. The microwave source is composed of multiple magnetrons and corresponding protective circuits. The size of the workroom is 1200cm x 50cm x 50cm. There is a door on each side of the heating box to facilitate the removal of the specimen. The main technical parameters were set as: 2450 + 50 MHZ microwave frequency, output power of microwave 24 kw or less, the work environment temperature 0 to 40 C, and cooling water flow rate of 4 to 6 L/min. Scanning electron microscopy was performed with an FEI QUANTA200 environmental scanning electron microscope (SEM; Hillsboro, OR, USA). The processed samples were cut according to the diameter section, the tangential section, and the end surface, and then sprayed with gold. The specimen was cut into 2 cm×2 cm×1 cm and boiled in water to soften it. The sample was cut face up, by hand, using a double-sided blade. It was placed in a small weighing flask to keep it clean; after dehydration and drying, the back and both sides were attached to the sample table with conductive adhesive. After dust removal, the sample was vacuum-plated with ion sputtering instrument and transferred into the sample chamber (Wang 1998). Larch wood tracheids are thick-walled, hollow, and thin; the long cells are arranged axially and support the green tree. On the cell walls of tracheids, there are numerous pits for conducting sap in the green tree. When wood is treated for fire retardation and anticorrosion, the tracheids are the main channel for the impregnation treatment. However, it is important to get through this channel to improve the permeability of the larch wood (Chen et al. 1987). The major path of wood fluid motion is the pit membrane (Gertjejansen 1970; Siau 1984); the pits affect the wood’s permeability and determines its impregnability (Bao 1965; Bao and Lu 1992). The pits of larch heartwood in the axial tracheid wall are bordered pits, and their tori are very clear. There is a thick flat torus in the pit membrane. There are many intercellular spaces which are direct channels for liquid movement between adjacent cells among microfibrils of margo around the torus. The pit membrane and pit border of heartwood bordered pits, as well as the cell surface, are often covered with a thin non-cellulose membrane layer. 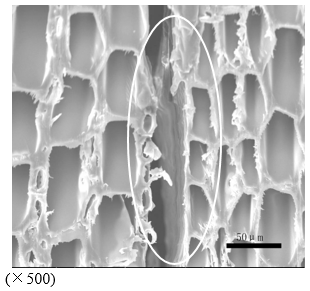 This membrane layer contributes to the poor permeability of larch wood (Peng et al. 1985; Zhou and Jiang 1986). As shown at (1, 2, 3) points in Fig. 1 (A), (1) point in Fig. 1(B), and 1(C), after microwave treatment, the torus in the pits of the tracheid wall had been cracked. At (1, 2, 3) points in the Fig.1(A), the torus of the pits tends to break from one side of the tracheid; however, only some tiny cracks were broken in the torus of Fig. 1(B) and 1(C). The different shape of the ruptured torus may be due to the different thicknesses of the non-cellulose membrane layers on the tori and of the tori (Zhou et al. 1986). Namely, the non-cellulose membrane layer on the torus at (1, 2, 3) points in Fig. 1 (A) is less than Fig. 1 (B) and 1(C), and the torus is thinner. Thereby, the steam pressure engendered during the microwave treatment was more easily released at (1, 2, and 3) points in Fig.1 (A) and the damage was greater. At (2) point in Fig.1 (B), some tiny cracks were generated in the margo of the pit. The margo of the pit is thinner than the torus, but the pits were covered by the non-cellulose membrane layer. During the microwave treatment, instantaneous steam pressure generated was released at the thinner positions of the margo of the pit and of the torus; thereby, the pits were ruptured. After the high-intensity microwave treatment, the channels of the pits were opened and the cracks were generated at the torus and the margo of the pits consequently improving the larch wood permeability. As shown at (2) point in Fig. 2, (1) point in Fig. 4(A), and Fig. 4(B), the cracks with different shapes were formed approximately along the S2 layer and distributed asymmetrically, suggesting that these cracks were not caused by the release of growth stress and that these cracks were caused due to microwave modification treatment. In Fig. 2 (1), the crack that was formed along the S2 layer of the tracheids can be found in other electron microscope photographs. Because these small cracks were distributed evenly along S2 layer, one may speculate that these cracks were caused by the release of growth stress during the drying. 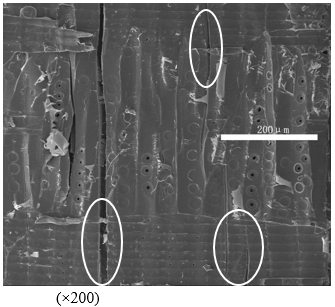 The tiny cracks of the tracheids are not significantly influential on the mechanical properties of larch wood but improve larch wood permeability. After the microwave treatment, the intracellular layer among tracheids formed cracks, as shown in Fig. 3, at (2) point in Fig. 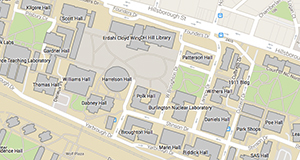 4(A), and at (1, 2) points in Fig. 4(C). Particularly in the case of (1) point in Fig. 4(C), the cracks of the intracellular layer and the tearing may mainly be due to the instantaneous bursting of the high pressure steam generated by the microwave; the cracks improve larch wood permeability. Although this crack is not throughout the whole wood specimen longitude, this crack is big enough to affect some mechanical properties of larch wood. After the microwave treatment, the microstructure of the pits, the tracheid wall, and the area between the tracheids showed changes in the earlywood parts of larch wood, and treatment results were very distinct. In the latewood parts, some tiny cracks existed between the tracheids, and obvious microstructure change was not found in the tracheid wall. This may be because the latewood tracheid wall is thicker and less easily destroyed. After larch wood was treated by microwave, there were many tiny cracks along the wood rays. As the cells of the wood rays are mostly thin-walled tissues, and thus the cell wall is usually relatively weaker, the steam pressure produced during microwave treatment was easily released, so they were easily broken. Figures 5 and 6 indicated that the instantaneous steam pressure generated by the microwave treatment was so great that the cracks among the tracheids extended along the wood ray in the vertical cell arrangement. Although this fracture improved wood permeability, it has effects on wood’s strength and application. Consequently, the wood modified by microwave treatment needs to better control the technology conditions. Figures 7(A) and 8(A) showed that cracks were formed between the fusiform wood ray and around the axial tracheid, while Figs. 7(B) and 8(B) indicated that the uniserial wood rays were broken by the instantaneous steam pressure generated by the microwave treatment and tilted to the same side. These changes indicated that the channel of the larch wood has been opened, consequently improving the larch wood permeability. Figures 9 and 10 show that, after microwave treatment, the end section cracks of larch wood were greater and wider. 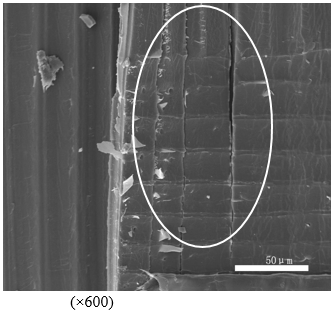 This result suggests that the microwave treatment generated the larger instantaneous steam and more easily broke wood ray organizations that were more weakly positioned among the wood tissues. Again, through microwave treatment, water in the wood dissipated quickly, leading to dry cracks. Through better control of the microwave processing technology, the amount and the size of the cracks can be controlled within a certain scope. In this way, larch wood can be treated by controlling microwave processing technology to achieve the effects desired. In the larch wood treated by microwave irradiation, cracks play a key role in the improvement of larch wood permeability. As the dimensions of the cracks are so small, the appearance and the mechanical properties of larch wood are not greatly affected by the intensive microwave treatment. Larch wood was treated by high-intensity microwave radiation. Under observation by SEM, the micro-structure was changed in the weaker positions, particularly, on the pit membrane of the earlywood tracheid wall, the tracheid wall surface, among the tracheids, and the wood ray on the latewood and earlywood tracheid. There were cracks among the tracheids, and some of them got through the wood ray section along the vertical cell arrangement direction and broke the wood ray. However, the structure apparently changed was not found on the tracheid wall surface of the latewood. These changes showed that microwave treatment opens up the channels inside the wood. It is of great importance for drying and impregnation with solutions, as well as other permeability related processing of larch wood. The authors acknowledge the Ministry of Education National Natural Science Foundation (31300477), the Special Program for Young Teachers promotion program of Beihua University, the Jilin Provincial Key Laboratory of Wooden Materials Science and Engineering (Beihua University), and the Strategic Alliance Project of Industrial Technology Innovation in Jilin province (20140309019NY). Bao, F. (1965). “The tentative study of liquid permeability and disposal approach of larch wood,” Scientia Silvae Sinicae 10(1), 1-17. Bao, F., and Lu, J. (1992). “A study on the principle of permeability control of wood,” Scientia Silvae Sinicae 28(4), 336-342. Chen, B. L., Peng, H. Y., and Li, G .F. (1987). “Observation of tracheid micropores in larch xing-an and discussion on the influence of permeability,” Journal of Northeast Forestry University 15, 99-105. Gertjejansen, R. (1970). “Longitudinal water permeability of gamma irradiated Sitka spruce heartwood,” Wood Science 2(3), 168-170. Peng, H., Li, J., Qiao, Y., Chai, Y., and Cui, Y. (1985). 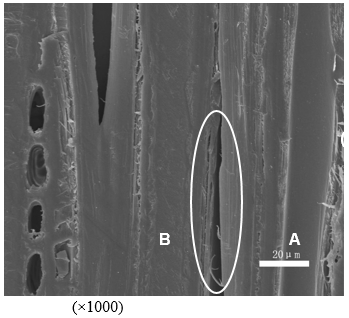 “A preliminary survey of the wood ultrastructures of Pinus koraiensis Sieb. et Zucc. and Larix gmelini (Rupr.) Litvin,” Scientia Silvae Sinicae 21(1), 102-104. Siau, J. F. (1984). Transport Processes in Wood, Syracuse University Press, Syracuse, NY, USA. Torgovnikov, G., and Vinden, P. (2000). Microwave Modification of Wood Properties: Improvements in Wood Permeability (IRG31, IRG/WG-40181), International Research Group on Wood Preservation, Kona, HI, USA. Vinden, P., and Torgovnikov, G. (2000). “The physical manipulation of wood properties using microwave,” in: Proceedings: International Conference of IUFRO, The Future of Eucalypts for Wood Production, Tasmania, Australia, pp. 240-247. Zhang Y. L., Jia, K., Cai, L. P., and Shi, S. Q. (2013). “Acceleration of moisture migration in larch wood through microwave pre-treatments,” Drying Technology 31(6), 666-671. Vinden, P., Torgovnikov, G., and Hann, J. (2011). “Microwave modification of radiata pine railway sleepers for preservative treatment,” European Journal of Wood & Wood Products 69(2), 271-279. Zhou, Y., and Jiang, X. (1986). “Ultrastructure and its effects on the permeability of the wood of Larix olgensis Henry,” Scientia Silvae Sinicae 22(3), 260-269.
the wood of Latix olgensis Henry,” Scientia Silvae Sinicae 22(3), 260-269. Zhou, Z., Jiang, T., and Wang, Q. (2007). “Effects of intensive microwave irradiation on mechanical properties of larch wood,” Journal of Northeast Forestry University 35(2), 7-8. Article submitted: September 15, 2018; Peer review completed: November 5, 2018; Revised version received; December 12, 2018; Accepted; December 15, 2018; Published: December 19, 2018.